Ever wonder why when you have enough money, you don't have enough time to enjoy it? We seem to have the money to buy books on how to appreciate the 'now' and become happier - but not the time to actually read them and experience their promised contentment and pleasure. Time is the one essence of life which is truly limited. There are only 24 hours to a day and there are only so many days to our lives. How many hours in the day do modern people spend to make money to buy things? And are these things they buy really necessary at all? I recall a lecture in International Trade, where the instructor compared the GDP of the USA to the GDP of the Eurozone. (This was a few years ago.) Her conclusion seemed to be that more GDP is better. But after looking into the figures, I discovered that not only is the GDP of Europeans less than US GDP, but their work week was also significantly shorter. Most Europeans enjoy from 7 to 10 weeks of paid holidays from work. Yes, Europeans spend more time on leisure activities and more time with their loved ones. From my perspective, this is a healthier lifestyle: GDP does not a happy heart make. Americans are the best 'consumers' in the world. 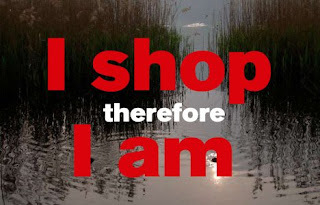 Looking at the definition of consumerism: Consumerism is the equation of personal happiness with consumption and the purchase of material possessions. Now John Naish has brought us its antithesis, Enoughism. Enoughism is the theory that there is a point where consumers possess everything they need, and by buying more it actually makes their life worse off. Enoughism emphasizes less spending and more restraint in buying behaviour of consumers. Unlike Consumerism which Mirriam-Webster defines as "the theory that an increasing consumption of goods is economically desirable", Enoughism is an antonym to consumerism. It is true that if people enjoy what they have (when their necessities are provided for), that corporations will be very unhappy indeed - because their profits will shrink. The ultra rich will have to be satisfied with only 150 pairs of shoes, only 2 townhouses, only 2 Rolls Royce etc. I don't just don't give a flying fart...let them adjust. That's what we all must do if we are to create a sustainable lifestyle on earth for the future. I am not an economic commodity for the use of the elite capitalists: economies exist for the well being of people primarily, all people not just a few. One thing is for sure: either we will collectively say 'enough is enough' voluntarily NOW; or future generations will be forced to exist on what is 'not enough'. I hope the conclusion we come to is that More is LESS - less happiness, less loving, and less quality living and less time for the people we love.